Photographs taken by local Artists within The Adirondack 6 million acre park in upstate New York: Lake Placid, Saranac Lake, Glens Falls, Old Forge, Lake George etc. selection of photographs taken by local artists. 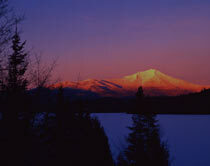 Click here to preview the stunning works from Adirondack photographer Carl Heilman. 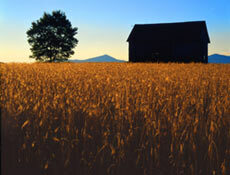 We invite you to preview the newest portfilio of photographic prints by Frank Houck in our Adirondack Gallery. How would you like to find an outdoor photography opportunity that is constantly changing; take on an unique complection each season and is near your home? Consider waterfalls, they're easily accessible to nearly everyone in all parts of the country and each geographic region offers its own special traits and qualities that lend a touch of the land to the waterfalls. We know outdoor photography means doing it in the out of doors, but does this mean going as far off the beaten path as possible? Not necessarily. For many people, time and travel are limited and for this reason waterfalls present the perfect outdoor photographic opportunity. Some falls may be miles back in the wilderness or accessible only certain times of the year. Zion National Park in Utah has a falls that is photographed but one time a year as it is reached by hiking through the narrows of the Virgin River which is closed due to possibility of flash flood for all but two weeks. In other regions, waterfalls are present only during spring runoff of the snowmelt or heavy rains. Yet for the average photographer, waterfalls are often as near the bridge down the road. Waterfalls, like the coals of a fire are naturally hypnotic and we find ourselves inexplicably drawn back to them again and again. People love them because they are ever changing, never holding still for a moment. Isn't it funny how you can catch yourself staring at something so natural? The seasons each weave their own special fabric in to the water adding lyrical beauty ti the motion and offering us further opportunities to test the eye and the lens. Falls are much like poetry in this regard. Taken in by a skilled artist the water presents a beautiful picture to the eye. Yet like poetry read out of synch, which offends the senses, waterfalls captured poorly are equally difficult to accept. As a year-round subject, waterfall are very versatile. Choice of shot location is one of the keys to this versatility. A person can shoot from above, from a bridge, at the top as the water cascades over the edge or from below. The falls can be sectioned or complete and close-ups yield some unusual images especially in winter. The possibilities are limited only by a person's imagination and stamina. Shooting waterfalls also makes for a great outdoor photo trip. Aside from the variety of shots available; the rippling waters of a mountain stream or the roar of a thundering cascade tends to soothe and relax a person. Bringing someone along to share the experience with can also provide a necessary subject to put the falls in perspective. And as the experts will tell you, people shots sell. Types of lenses and filters are, of course, the choice of the individual photographer and the perspective they wish to convey. One region of the country is renowned for its abundance of waterfalls, the Adirondack Mountains of upstate New York. Essex County in the heart of the High Peaks, 46 of which tower over 4000 feet in height, has more falls per square mile than any other country in the state. It was near Lake Placid, home of the 1932 and 1980 Winter Olympic Games, that we caught up to Frank Houck. Frank is a professional photographer who specializes in landscapes and practices his craft in this mountainous regions. We spoke to Frank and asked him about some of the problems often encountered when photographing waterfalls. "One of the most common problems", says Frank "is the constant updraft of air currents caused by the force of water falling from great heights. This causes nearby trees, overhanging limbs, etc. to remain in constant motion. This makes shooting at slow shutter speed very difficult. : Furthermore Franks adds, "It also makes protecting the lens from mist and spray necessary but difficult task, especially in winter as the mist freezes instantly. When asked to address the pleasures of shooting falls over the seasons, Frank responds, "In winter- getting near the falls working your way over the ice covered rocks, stream beds and ledges all the while protecting your equipment is very challenging. You can also get a completely new perspective on a falls in winter as the frozen water gives you a new platform on which to shoot that is not available in any other season." What about exposure we asked, "On falls from great heights of falls with a small volume of water coming over them, a shutter of 1/8 of a second to 6 seconds can be used. This gives the water a soft, silky flowing appearance. Heavy duty waterfalls with a high volume of water requires a faster shutter speed of 125th or 1/60th of a second. This stops the action and adds power, body and definition to the falls. A forceful falls taken at too slow a shutter speed causes the water to take on a milky quality and the muscle and drama of the water is lost."